The remains of seven men have been found there so far. Police investigate a property along Mallory Cres. in Toronto as part of the Bruce McArthur investigation on July 4, 2018. TORONTO— Investigators clung to the steep edge of a ravine on Thursday, some on their hands and knees, as they scraped through heaps of dirt and brush searching for more human remains near a home in mid-town Toronto where accused serial killer Bruce McArthur worked as a landscaper. 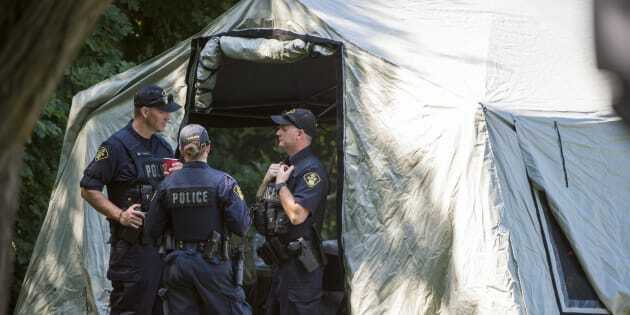 Some remains were discovered at the property Wednesday afternoon, just hours after police resumed digging in the area for the first time in about five months, said Det. Sgt. Hank Idsinga. "We have work to do ... linking them to the McArthur investigation, but I think geographically, where the remains were found, we're not going to have much of an issue doing that,'' Idsinga told reporters near the site where the remains were found. Just a few metres away, about 20 police and forensic workers used spades and trowels to scoop compost found in the ravine into large plastic buckets, hauling it down the hill to sieve-like tables where a pair of anthropologists sifted through the detritus. Investigators have previously found the remains of seven men hidden in large planters at the home. Idsinga said the remains recovered Wednesday could be from one or more of those men. McArthur, 66, has been charged with first-degree murder in the deaths of eight men with ties to Toronto's gay village. The remains of only one of those men — Majeed Kayhan — have yet to be found. McArthur is alleged to have killed Kayhan, Selim Esen, Skandaraj Navaratnam, Andrew Kinsman, Dean Lisowick, Soroush Mahmudi, Abdulbasir Faizi and Kirushna Kanagaratnam. A handful of neighbours gathered in the parkette across from the property Thursday morning, watching police come and go. The search of the ravine is expected to continue for another week, Idsinga said. The remains have been sent to the Ontario Forensic Pathology Service for further examination, he added. McArthur's case is scheduled to return to court on July 23. The remains have been sent to the Ontario Forensic Pathology Service for further examination, he said. Idsinga anticipates the excavation will continue for another week.